When I first started my proofreading business, most of my work was on paper. Back in 2006, I was working primarily for publishers. These clients often wanted me to proofread against copy rather than blind. That meant that I was receiving large packages through the mail containing not only the final page proofs but also the galley proofs. Postage costs were huge, though my clients bore the cost; but I still had to factor in the time I spent either waiting for couriers or hopping into my car and driving to the post office so that I could return the galleys and marked-up proofs. These days, things are different. Many of my publishers have embraced digital mark-up. I’m still required to work on final page proofs, and the clients still like me to annotate using UK-industry-standard mark-up language, but I can do it all onscreen — using my PDF editor’s commenting and mark-up tools — and the stamping tool. This saves the publisher money by eliminating postage costs and removing the need to print hundreds of pages of hard copy. It also saves me time, and, for those of us in the business of editorial freelancing, time is money. Many editorial professionals have already embraced digital mark-up (either on PDF or in Word). Little of what follows may be news to them. Even though this essay is aimed at the novice who is in the process of investigating digital workflows and the tools available to assist them, experienced professionals, and professionals seeking to expand into proofreading, are likely to find the information valuable. First, I’m a UK-based proofreader. If you’re from elsewhere, you might not recognize some of the symbols shown in this essay. That’s not because the symbols are wrong, but because there are differences in mark-up language between countries. The British Standards Institution has issued the BS 5261C:2005 “Marks for Copy Preparation and Proof Correction,” (readers can buy a hard-copy list of these marks from the Society for Editors and Proofreaders) and that’s what my publisher clients expect to see. Your clients might have different expectations. In my October column of An American Editor, I’ll show you how to create your own digital proofreading stamps. 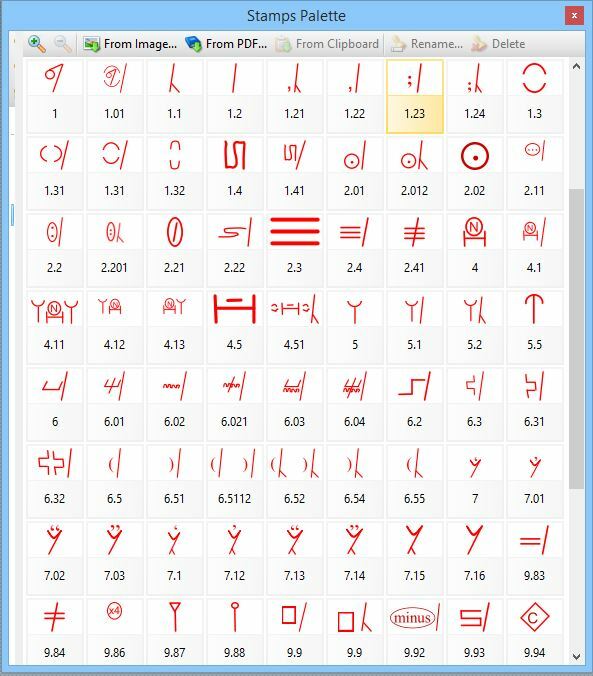 This may be useful if you need proof-correction symbols that aren’t already available from the resources provided below, or if you need to a modified version of an existing symbol. Second, stamping tools can be used in a number of different PDF editors. My own preference is PDF-XChange (from Tracker Software). Some of my colleagues prefer Tracker’s PDF Editor. Others, still, use Adobe Acrobat Professional or Adobe Reader. If you’re not sure what suits you best, take advantage of the various free trials on offer. For demonstration purposes, some of the screenshots in this essay are based on working in PDF-XChange. However, the underlying principles are the same. The screenshot above shows a partial view of the PDF-XChange stamps palette. I’ve chosen to number the symbols, rather than naming them, because this allows me to change the order easily (see “Onscreen proofreading tips: Reorganizing your stamps palette in PDF-XChange”). Each symbol in a palette can be selected and then stamped onto a PDF using the relevant tool, usually accessed through the PDF editor’s comment-and-mark-up toolbar. Which mark-up language should you use when stamping PDFs? The answer is not actually as straightforward as one might hope! As far as I’m aware, my Irish and Australian colleagues find the BS 5261C:2005 symbols acceptable (feel free to correct me if I’m mistaken); in the UK, these BSI marks are absolutely considered standard. However, my Canadian colleague Adrienne Montgomerie, in her essay “The Secret Code of Proofreaders” (Copyediting, October 15, 2014), points out that for editorial professionals in parts of North America “[t]he challenge is always whether or not the designer will understand the marks. It’s hard to say that there are standard marks.” She goes on to illustrate the differences between the Canadian Translation Bureau’s Canadian Style guide marks and the marks preferred by the Chicago Manual of Style. The best advice I can give to novices is that they check with their national editorial society and their clients before embarking on this type of work. Why use mark-up language on digital proofs? Using stamps isn’t the only way to mark up a PDF, of course. 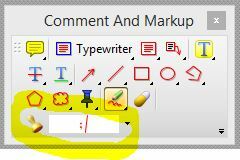 Some of my colleagues’ clients prefer sole use of the commenting and mark-up tools embedded in their PDF editors. 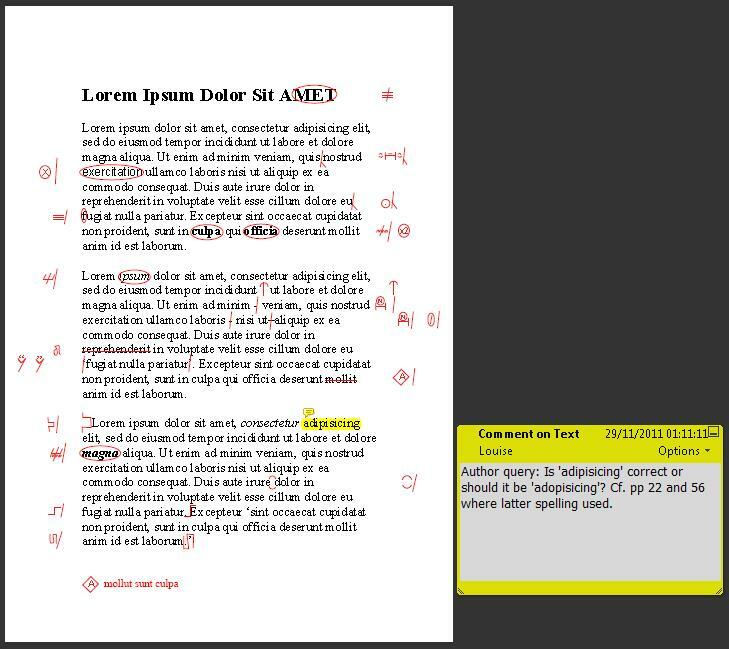 When I use the stamping tool, it’s because my client wants to see all the suggested corrections in the page-proof margin (just like with a hard-copy proofread) rather than in pop-ups (see the example later in this essay under “What does a stamped PDF proof look like?”). Ask your client what they prefer. If your client wants all the annotation in the margins of the page proofs, there’s very little room in which to work. Specialized mark-up language, even when working digitally, is an efficient way to tell the typesetter/designer what to do. Stamping a symbol on a PDF, or drawing a symbol on paper, is quicker than writing out an instruction. Being able to mark up in this way can therefore increase efficiency and productivity. If you’re working for fixed fees, it’s a timesaver and money-earner. If you don’t understand how to mark up using this specialist language, you’re marketable to fewer clients. It therefore makes good business sense to acquire the skills to mark up in this manner, both on paper and digitally. Where can I find digital stamps? If you want to use the BS 5261C:2005 proof-correction marks to annotate a PDF, you can find everything you need on my blog, The Proofreader’s Parlour, in the Stamps archive. In particular, “Roundup: PDF Proofreading Stamps (quick-access links)” provides the access links to a full set of downloadable PDF proofreading stamps and the installation instructions. U.S. stamps files are available via the Copyediting-L site, under the Resources tab. Scroll down to “Diana Stirling’s (2008) editing marks for PDF documents (Zip documents)”. Finally, search the Editing Tools section of Katharine O’Moore-Klopf’s Copyeditors’ Knowledge Base using the key words “PDF Editing Stamps.” This will bring up a number of useful resources that you might prefer to try. Where can I learn onscreen mark-up? If you’re already familiar with standard proof-correction marks, and have used them extensively on paper-based projects, you might well be able to teach yourself to mark up onscreen with stamps. That’s how I went about building my digital mark-up skillset. However, if you’re a novice or lack confidence, you might prefer more formal training that introduces you to using proof-correction language correctly and clearly (whether on paper or digitally). In the UK, the SfEP and The Publishing Training Centre, to give just two examples, include onscreen mark-up as part of their distance-learning proofreading training. In June and July 2015, Adrienne Montgomerie ran webinar on “Editing on PDF” via the folks at the Editorial Bootcamp. You can still buy the five video-recorded sessions and the companion handouts and exercises here. There is also some good, and free, online guidance on the Right Angels and Polo Bears blog under the Acrobat PDF archive. See also the Stamps and Working Onscreen archives on the Proofreader’s Parlour. What does a stamped PDF proof look like? A PDF that’s been marked up using proof-correction stamps looks just like its paper cousin – the only difference is that it’s in a file on your computer rather than in a pile on your desk. As you can see from the sample below, you can, of course, use the onboard tools. Here, I’ve added in a query for the author (using the Commenting function); if, however, my client had wanted all annotation to be viewable in the margins, I’d have created a separate query sheet to communicate my concern with the highlighted spelling issue. Proof-correction marks are not a thing of the past — far from it. Whether you are working on paper or onscreen, being able to offer this method of annotating a proof is a valuable business asset. It gives both you and your clients choices. There will be times when a client will prefer you to work on paper, or directly in Word. And there will be times when you work with clients who don’t know the meaning of proof-correction symbols, and will ask you instead to use a PDF editor’s onboard commenting and markup tools. But if you are going to be working with clients who want a traditional margin-based proofreading service (where all your annotations are made on the typeset page) but in a digital format, the ability to mark up using proofreading stamps will serve you well.